13U Girls Black Dynamite take Silver Medal at Provincials! 13U Provincials – April 17, 2015 V-Day: The Battle in Waterloo. Black Dynamite Takes Silver Medal. So it finally arrived! V-Day – the battle in Waterloo. Nope! This is not a blunder on historical dates or incorrect reference to D-Day or the Battle of Waterloo. 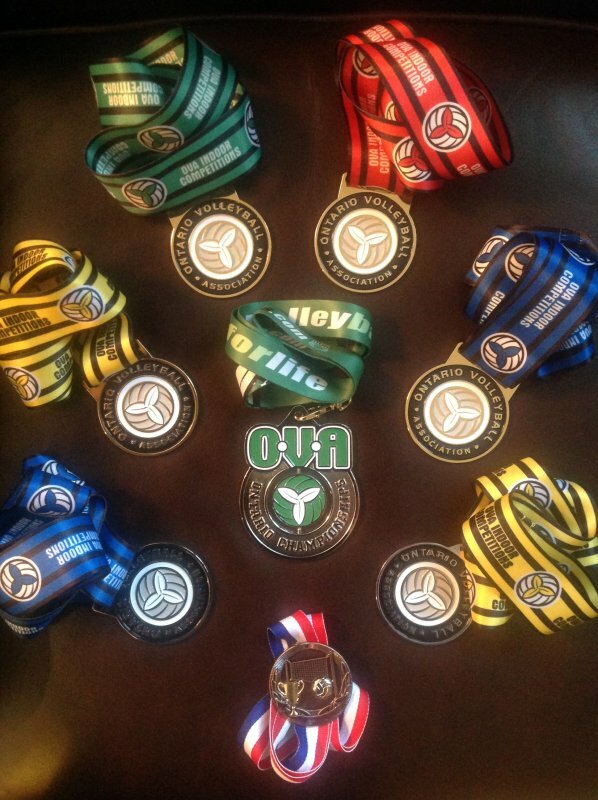 This was the Ontario Volleyball Championships and the denouement for the 13U Black Dynamite season. A three day campaign with hundreds of volleyball warriors waging battle on the courts of the 500 acre RIM Park facility in Waterloo. The first two days of Matches involved Pool play. Black Dynamite’s strong net play, serving rallies and nimbleness showed that their ranking of #1 has been well earned with a record of 6-0 (never losing a set) after the first two days of matches. Day three came quickly with Elimination play. Dynamite once again showed their strong competitiveness and depth of skills with victories over the Hurricanes [25-17//25-21], the Titans [25-22//25-20], and the Rapids [25-13//25-22] – once again never losing a set. On to the Gold medal Match against the always tough Aurora Storm Avalanche. Stephen Spielberg could not have produced a more fitting ending to the season than having the #1 and #2 ranked teams pair off against each other. This was going to be one great match!! Storm presented a few formidable athletes that clearly haven’t needed a wristband at Wonderland since likely the age of 8!! Let’s just say they were not vertically challenged (we can clearly rule out any lineage to Napoleon in this battle of Waterloo). The first match was very close with the lead changing hands 4 times in the first half of the game. Dynamite fell behind trailing at one point 12-20. True to form, Dynamite fought back and showed their tenacity and heart bringing the set to a 20-22 score. However, Storm’s strong serving and spiking prevailed bringing them a hard-fought victory. 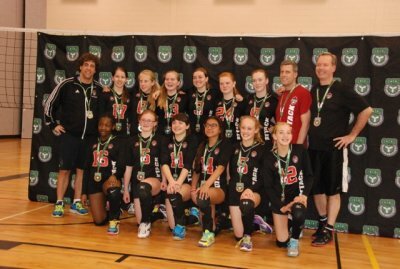 What an exciting tournament – a silver medal in the Ontario Championships for 13U Black Dynamite!!! What a sensational performance for Black Dynamite this season with eight medal-winning performances. The dedication, sacrifices, and commitments made, the performances given, the experiences encountered, the lessons learned, the friendships formed, the emotions felt, the laughter had, the memories created….it goes far beyond the court. There is no doubt this was a season and team that will be remembered by all. It would be remiss not to highlight a BIG THANK YOU to the supporting cast of the Athletes – the Coaches, Parent Reps, Parents, Siblings, Extended Family and Friends, Trainers, Volunteers and Durham Attack Club – a heartfelt thanks for the innumerable contributions in the development, coaching and mentoring of our Athletes as well as the enrichment of our community and competitive sports. Congratulations ladies on your outstanding achievements this season!! I have thoroughly enjoyed sharing the highlights!